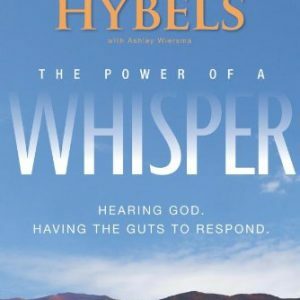 In The Power of a Whisper by Bill Hybels of Willow Creek Community Church, Hybels talks about how to hear and discern the voice of God from all the other 'voices' that compete for your attention. God still speaks…are you listening? In this powerful yet practical video curriculum, you will learn how to discern the “voice” of God from other voices that vie for your attention, how to invite his input into your daily routine, how to “practice” his presence and how to allow heaven-sent input to direct your life toward making a kingdom-oriented difference in this world. 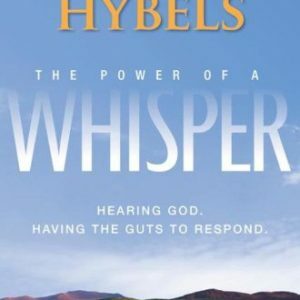 In this four-session small group Bible study, The Power of a Whisper, Bill Hybels casts vision for what life can look like when directed by divine input – whispers – from above. 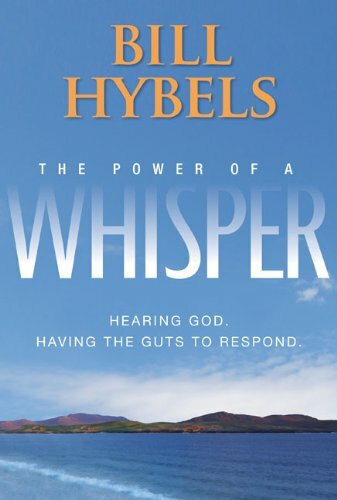 Through firsthand accounts spanning more than thirty years spent in the trenches of ministry Hybels’ passion is to invite every Christ-follower to learn how to live with one ear perpetually tuned to heaven and how to meticulously obey every syllable of input received. In this powerful and practical small group bible study, you’ll learn how to discern the ‘voice’ of God from the other voices that vie for your attention, how to invite his input into your daily routine, how to ‘practice’ his presence and how to allow heaven-sent input to direct your life toward making a kingdom-oriented difference in this world. 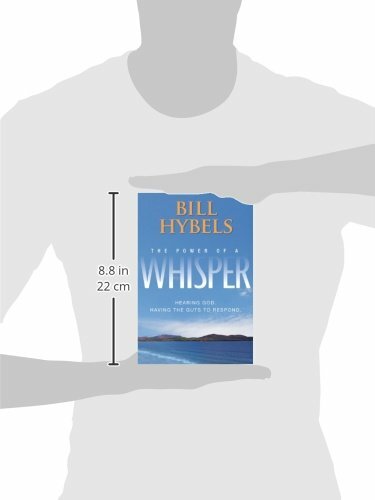 This Participant Guide is designed to help facilitate group discussion and further study alongside The Power of a Whisper DVD (included in this pack). 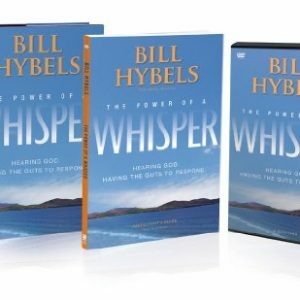 The DVD is designed to help facilitate group discussion and further study and features four 10-15 minute live teaching sessions from Bill Hybels. I liked this so much I am using it to lead my small group. If everyone would keep an ear to heaven, it makes Bible Study much easier to understand as we listen to God pull on our heart strings; this gives added insight into inductive studies. 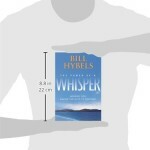 Bill Hybels teaches how we can listen to God in the many ways He speaks to us. All we have to do is stay still enough and want to listen to Him. This material will help you open your ears and heart to hearing God’s promptings as He choses to whisper promptings to us. It helps us filter the messages we receive so that we will recognize and respond. If any of your small group members enjoy reading the hardback (which isn’t totally necessary to conduct the group), be sure that they have it prior to session 1 as there are 3 chapters recommended prior to the first meeting. Our hearts have been convicted by the Holy Spirit to listen as He divinely prompts us – guiding us in our every day goals to some life-changing stretching. This helps us move out of the humdrum of our everyday lives to a deeper relationship with our God Who desires communication as a two-way street. All 16 participants agreed that even just the first session was vision-changing. It’s Spring when some groups are closing down for the season – but we have 2 groups now and will offer it again in the fall! I am currently teaching this in an evening class to my church. It is easy to read, concise, practical and very helpful. The video portion of the class is also excellent. 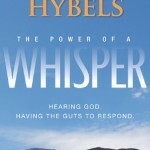 The power of a whisper curriculum is a good DVD and small group study. The stories are well told and give some food for thought. I was hoping for a little more emphasis on developing the contemplative practices – as in Emotionally Healthy Spirituality – in order to make us more aware of God’s whispers. We studied this book and watched the accompanying DVD for our first study together at our new campus. It was just a short one, so we were able to chat and read the scriptures together in between or after the DVD. It is very basic, but the stories that form the basic curriculum are very instructive. This is a good choice for a first or introductory study.